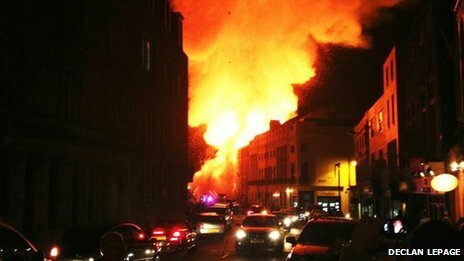 More than 80 firefighters tackled a blaze in Windsor which began at about 22:00 BST on Tuesday. The building partially collapsed following the major fire . About 12 people were forced to move to temporary accommodation for the night owing to the fire’s close proximity to residential properties. The upper floors of the building – the usage and owners of which have not yet been established – partially collapsed along with the surrounding scaffolding. Crews came from Berkshire, Buckinghamshire, London, Oxfordshire and Surrey to fight the fire, while police were required to manage crowds of onlookers. The fire service cordoned off the area and said it expected to be on-site for several hours. 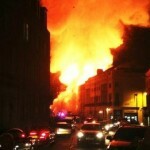 As yet there is no indication as to the cause of the fire. Half of the Lakeside shopping complex in Thurrock was filled with smoke when fire crews arrived at about 21:00 BST on Tuesday. 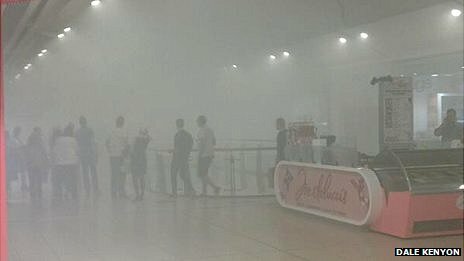 The shopping centre, Europe’s largest, was evacuated after a smoke canister was set off in a shop. 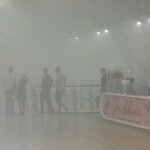 Eyewitnesses told of their shock at finding themselves surrounded by smoke. Staff moved all shoppers and workers out of the building. A high pressure fan was used to clear the site of smoke. It is understood Lakeside will open as normal on Wednesday. Essex Police is yet to comment on the incident.